Over 160 students attended Maidstone Hospital’s annual careers event today (28 March). The event was the third of its kind and was run by Maidstone and Tunbridge Wells NHS Trust (MTW) Learning and Libraries team in conjunction with Health Education England, across Kent, Surrey and Sussex, plus Kent and Medway STEM Hub. The day aimed to provide an innovative and interactive programme for 14-19 year olds to develop their understanding around health and social care careers. 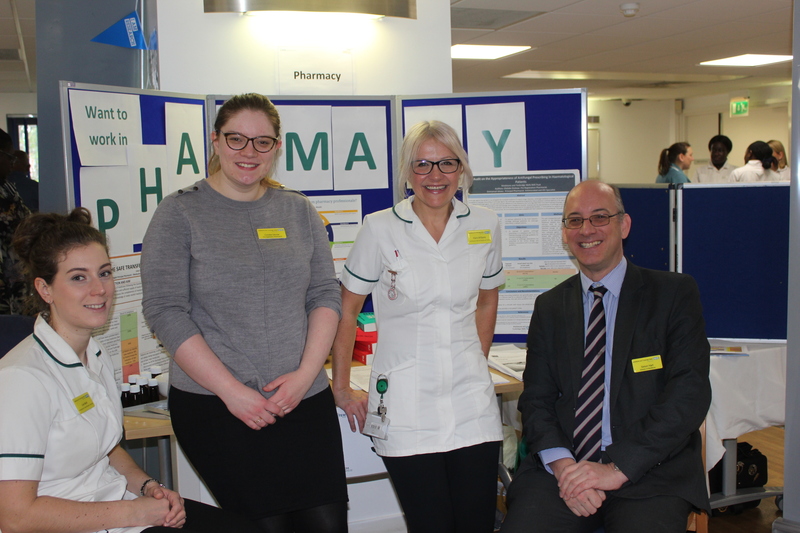 There were more than 20 stands at the event with representatives from a cross-section of departments from MTW, including Pathology, Research, Estates and Facilities and Surgery, as well as from health related organisations including. SECamb, Sense, MCCH and LDC Care. During the event, students had the chance to split into small groups and speak to representatives from all the organisations in attendance. They also had the chance to watch medical simulation presentations and even try their hand at simulated laproscopic surgery and CPR. There were definitely some budding surgeons in the groups. Several teachers accompanied the students and one said: “This is a brilliant event. It’s exactly what our students wanted to see and I know many of them were inspired by what they saw giving them a real understanding of what the NHS is all about and what it has to offer as a career”.